Sportsman's Warehouse Holdings Inc (NASDAQ: SPWH) rose 11.9 percent to $3.87 in pre-market trading after the company posted upbeat Q2 profit. Calpine Corporation (NYSE: CPN) rose 10.7 percent to $14.95 in pre-market trading after the company agreed to be acquired by investor consortium led by Energy Capital Partners for $15.25 per share in cash. Ross Stores, Inc. (NASDAQ: ROST) shares rose 10.2 percent to $58.75 in pre-market trading as the company posted stronger-than-expected results for its second quarter on Thursday. CTI BioPharma Corp (NASDAQ: CTIC) rose 10 percent to $3.43 in pre-market trading after dropping 5.17 percent on Thursday. American Eagle Outfitters (NYSE: AEO) rose 8.2 percent to $12.18 in pre-market trading after slipping 1.66 percent on Thursday. Opko Health Inc. (NASDAQ: OPK) rose 6.2 percent to $6.24 in pre-market trading. Cantor Fitzgerald initiated coverage on OPKO Health with an Overweight rating and a $20.00 price target. Applied Materials, Inc. (NASDAQ: AMAT) shares rose 5.4 percent to $45.45 in pre-market trading after the company reported upbeat earnings for its third quarter and issued a strong outlook for the current quarter. Golden Ocean Group Ltd (NASDAQ: GOGL) shares rose 5.1 percent to $8.57 in pre-market trading after declining 5.66 percent on Thursday. Estee Lauder Companies Inc (NYSE: EL) gained 4.8 percent to $103.00 after the company posted upbeat Q4 earnings and issued a strong FY 2017 earnings forecast. Gap Inc (NYSE: GPS) rose 4.5 percent to $23.71 in pre-market trading after the company reported better-than-expected earnings for its second quarter and raised its FY17 guidance. Sibanye Gold Ltd (ADR) (NYSE: SBGL) shares rose 3.5 percent to $5.91 in pre-market trading after declining 0.87 percent on Thursday. ICICI Bank Ltd (ADR) (NYSE: IBN) rose 3.4 percent to $9.32 in pre-market trading after falling 2.70 percent on Thursday. Control4 Corp (NASDAQ: CTRL) shares rose 3.3 percent to $23.01 in pre-market trading. Control4 will replace Albany Molecular Research, Inc. (NASDAQ: AMRI) in the S&P SmallCap 600 on August 22. 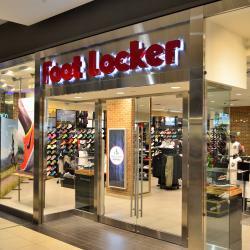 Foot Locker, Inc. (NYSE: FL) shares fell 15.6 percent to $40.25 in pre-market trading after the company reported weaker-than-expected results for its second quarter. Bazaarvoice Inc (NASDAQ: BV) fell 14.4 percent to $3.85 in pre-market trading after dropping 1.10 percent on Thursday. Infosys Ltd ADR (NYSE: INFY) fell 9 percent to $14.51 in pre-market trading after the company announced the resignation of its CEO Dr. Vishal Sikka. Hibbett Sports, Inc. (NASDAQ: HIBB) fell 4.4 percent to $11.00. Hibbett reported a narrower-than-expected loss for its second quarter, while sales missed estimates. The company also lowered its earnings forecast for the full year. Finish Line Inc (NASDAQ: FINL) fell 4.1 percent to $11.50 in pre-market trading after dropping 1.40 percent on Thursday. Matson, Inc. (NYSE: MATX) shares fell 3.2 percent to $28.43 in pre-market trading after declining 2.62 percent on Thursday. Nike Inc (NYSE: NKE) fell 3 percent to $55.75 in pre-market trading after slipping 1.84 percent on Thursday.